We’ve talked about the powerful influence others have on the way we see ourselves. Yet we should always remember that true value is granted by the One who created us in the first place. There is no greater sense of self‐worth than knowing that He is acquainted with me personally; that He values me more than the possessions of the entire world; that He understands my fears and anxieties; that He reaches out to me when no one else cares; that He can turn my liabilities into assets and my emptiness into fullness; and that He has a place prepared for me—one where earthly pain and suffering will be but a dim memory. Indeed, the Lord of the universe places so much value on us that He gave His life to save us. What a fantastic message of hope and encouragement for those who are broken and discouraged! This is self‐worth at its richest—dependent not on the whims of birth or physical attractiveness or social judgment, but on the decree of our loving Lord. Do we base our self‐image on the Lord’s divine decree? What is it that really makes you feel valuable? Do I let you know often enough how much I value you? How can I better show how much I appreciate you? How can we remember that our worth as human beings is determined not by what we do or how we look or what we own, but by the fact that we are children of God? Lord, we want so much to view ourselves and others from an eternal perspective. May we build our lives together on Your grand scheme, not on what is temporary and insignificant. Help us to live each day by the truth of Your divine decree. Amen. Be married on a Riverboat! Be married on a Riverboat by a real ship's Captain! 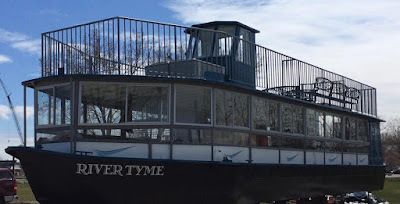 If you're looking to tie the knot — the one that's not related to speed — the riverboat River Tyme in De Pere, WI will host your bachelorette party, rehearsal dinner or intimate ceremony on board. “We have two captains (Cap'n Kenny being one) that can marry right on the boat". Food, drinks, and all other arrangements can be made to offer the bride, groom and their guests everything to ensure that their special day becomes a unique, beautiful and lasting memory. You shall make for yourselves no idols and erect no carved images or pillars, and you shall not place figured stones in your land, to worship at them; for I am the LORD your God. You shall keep my sabbaths and reverence my sanctuary: I am the LORD. If you follow my statutes and keep my commandments and observe them faithfully, I will give you your rains in their season, and the land shall yield its produce, and the trees of the field shall yield their fruit. Your threshing shall overtake the vintage, and the vintage shall overtake the sowing; you shall eat your bread to the full, and live securely in your land. And I will grant peace in the land, and you shall lie down, and no one shall make you afraid; I will remove dangerous animals from the land, and no sword shall go through your land. You shall give chase to your enemies, and they shall fall before you by the sword. Five of you shall give chase to a hundred, and a hundred of you shall give chase to ten thousand; your enemies shall fall before you by the sword. I will look with favor upon you and make you fruitful and multiply you; and I will maintain my covenant with you. You shall eat old grain long stored, and you shall have to clear out the old to make way for the new. I will place my dwelling in your midst, and I shall not abhor you. And I will walk among you, and will be your God, and you shall be my people. I am the LORD your God who brought you out of the land of Egypt, to be their slaves no more; I have broken the bars of your yoke and made you walk erect. But if you will not obey me, and do not observe all these commandments, if you spurn my statutes, and abhor my ordinances, so that you will not observe all my commandments, and you break my covenant, I in turn will do this to you: I will bring terror on you; consumption and fever that waste the eyes and cause life to pine away. You shall sow your seed in vain, for your enemies shall eat it. I will set my face against you, and you shall be struck down by your enemies; your foes shall rule over you, and you shall flee though no one pursues you. And if in spite of this you will not obey me, I will continue to punish you sevenfold for your sins. I will break your proud glory, and I will make your sky like iron and your earth like copper. Your strength shall be spent to no purpose: your land shall not yield its produce, and the trees of the land shall not yield their fruit. Paul, an apostle of Christ Jesus by the will of God, To the saints who are in Ephesus and are faithful in Christ Jesus: Grace to you and peace from God our Father and the Lord Jesus Christ. Blessed be the God and Father of our Lord Jesus Christ, who has blessed us in Christ with every spiritual blessing in the heavenly places, just as he chose us in Christ before the foundation of the world to be holy and blameless before him in love. He destined us for adoption as his children through Jesus Christ, according to the good pleasure of his will, to the praise of his glorious grace that he freely bestowed on us in the Beloved. In him we have redemption through his blood, the forgiveness of our trespasses, according to the riches of his grace that he lavished on us. With all wisdom and insight he has made known to us the mystery of his will, according to his good pleasure that he set forth in Christ, as a plan for the fullness of time, to gather up all things in him, things in heaven and things on earth. Ephesians 1:7-8a In him we have redemption through his blood, the forgiveness of our trespasses, according to the riches of his grace that he lavished on us. God’s grace is lavished upon us. Lavished. What a rich, beautiful word, derived from an old French word related to a deluge of water. Imagine standing in a desert after a long hike. Dusty, achy, thirsting. Deeply thirsting. Then suddenly a deluge of needed, desired, and yearned-for water falls over you, cleaning your skin, cooling your tired muscles, quenching your thirst. Life has a way of leaving us aching and thirsty for dignity and love. We have a way of leaving each other aching and thirsty for dignity and love. And in this deep soul need, God lavishes us with grace. Too often we imagine God’s love as a small drip of scarce water that falls upon us in rare, meager amounts we must earn. But no. God’s grace is lavished upon us. Drenching us in grace, cleansing us in mercy, nourishing us in love. God’s grace is lavished upon us, not because of anything we do other than stand in need. When your heart needs a safe place to hide, when you feel your dreams are drowning in doubt and darkness, close your eyes and call out to me and you will feel your Daddy in heaven quiet your spirit and whisper "Fear not my child, I am with you." Never give into the worries of this world, because you are mine and you can count on me to care for your every need. I will give you peace that goes beyond your problems and the power to pray through anything that stands in the way of my plan for you, my precious girl!